Smart business owners understand the importance of search engine optimization to build awareness of their brands, products, and services and drive traffic to their websites. As Google continues to evolve, business owners and marketers alike need to understand the huge difference between local SEO and generic SEO. SEO is one of the most cost-effective marketing strategies because it targets users who are actively looking for the products and services that your company provides online. Before you get started with your marketing strategy, you need to have a better understanding of the real differences between local SEO and generic SEO and what that means for your business. Then, armed with great information, you can and choose the best approach for your business. Businesses such as dental clinics, law offices, real estate agencies, mortgage brokers, plumbers, car rentals, restaurants (including big franchises such as Dominos and Pizza Hut), clubs, SPA centers, car dealers, and web agencies should set a local SEO strategy in order to position themselves locally and target local audiences. On the other hand, brand names and related products, manufacturers, platforms such as the Stock Market with Forex, and a number of data sources websites (horoscope and news websites) should set a generic SEO strategy. E-commerce websites need both local and generic strategies because they are both promoting products and brands and targeting a variety of local audiences around the world. For example a winery should use generic SEO for searches on wine brand names and Local SEO to promote the website on keywords as “wine shop” or “wine store”. To choose the best strategy for your business, you need to define your audience and combine search volume data with a competitive analysis of the keywords delivering the most traffic. Analyzing and comparing Google results in different locations for the same keywords will allow you to understand whether a local approach is appropriate for a specific keyword. Keywords such as “horoscope”, will trigger the same set of results in any location within the U.S. The rankings for this type of keyword can only be improved with a generic SEO approach by running link building campaigns. The next Google 1st Page SERP Competition Analysis is displaying the websites ranking on U.S. TOP 5 cities for “horoscope” search query. In order to be listed on the first page of Google you will have to fight against national competitors and this can be pretty tough, especially when you consider time and budget limitations. Although, keywords such as “horoscope” are extremely hard to outpass, there are lots of keywords in every industry that trigger the same set of result in more locations. To surpass this type of keywords, it is mandatory to approach the Local SEO strategy for each location in which your company provides its services. 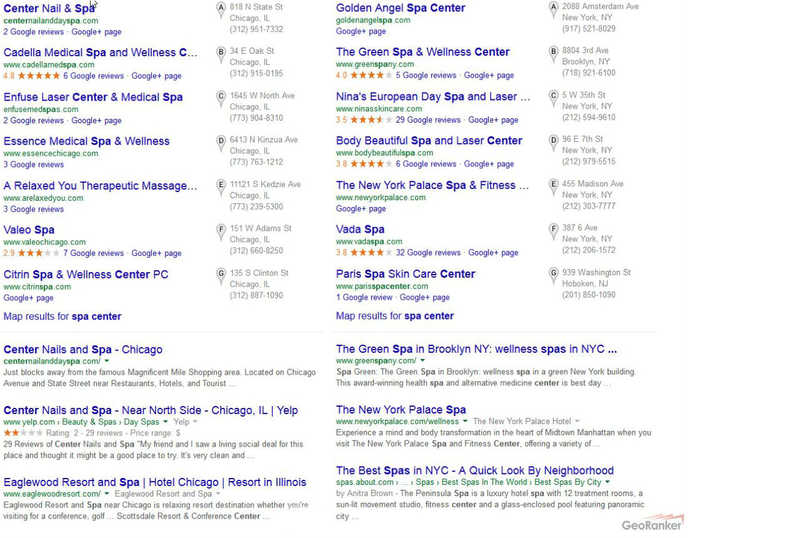 Keywords such as “spa center” will trigger different results based on the user’s location. Check out the following examples comparing the results seen by different users from Chicago and New York, and you will see that this applies not only to Maps Pack, but to organic results as well. For similar keywords such as “spa center”, which trigger different results based on the user’s location, sending local signals to Google will help increase rankings for local audiences. In this case, all competitors are local so the difficulty in outranking them is much lower than for keywords such as “horoscope”. Check the above screenshots from Google SERPs to see how different are the results for the same search query for users in different locations. Without local IP addresses, running local competitive analyses is a real challenge, but you can always use a local rank tracker system as the one from GeoRanker. Take a look at the following competitive analysis heatmap from Google’s search engine results page. The analysis displays a side-by-side ranking comparison for each location. Within the report, each website is displayed via a different color, in the same order as it is displayed in the Google Rankings. Local results are gray. The more grey areas there are, the more local competition you have. , In this case, over 60% of the results are local. Choosing between Local SEO or Generic SEO approach depends on the results consistency from one location to another. While for some keywords a focused local approach can bring great results and save time and money for other keywords only the Generic approach can do the job, which usually requires a larger budget. For businesses with local presence, targeting audiences within a specific geographic area (or areas) with the local SEO approach will save time and money. Spend less and win more! With a cost-effective SEO strategy you can trigger better results and by sending strong local signals to search engines you can outrank both local and national wide competitors.